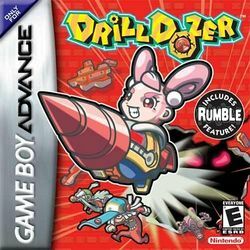 Drill Dozer (スクリューブレイカー 轟振どりるれろ, Sukuryūbureikā Gōshin Dorirurero? ), released in Japan as Screw Breaker, is an action platformer game for the Nintendo Game Boy Advance system, released in 2005 in Japan, and in 2006 in North America. It features a built-in rumble pack. The player plays as Jill. She is the daughter of Doug, the leader of a bandit gang known as The Red Dozers. Doug was ambushed by a rival gang known as the Skullkers. They attacked the Red Dozers to steal the powerful Red Diamond, a gift from Jill's dead mother. To retrieve it, Jill mounts the powerful vehicle, the Drill Dozer. This page was last edited on 12 January 2017, at 16:14.